Only three centuries ago, setting out to climb a mountain would have been considered close to lunacy. Mountains were places of peril, not beauty, an upper world to be shunned, not sought out. 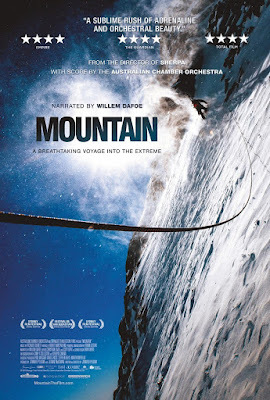 Willem Dafoe provides a narration sampled from British mountaineer Robert Macfarlane’s acclaimed memoir "Mountains of the Mind," and a classical score from the Australian Chamber Orchestra accompanies this majestic cinematic experience. Jen Peedom is a BAFTA nominated director, well known for her gripping, intimate portraits of people in extreme circumstances. Her credits include the internationally renowned documentaries SHERPA, MIRACLE ON EVEREST, LIVING THE END and SOLO, which played in the Official Selection of major documentary festivals including IDFA and Sheffield and won numerous awards including an AFI for Best Documentary. In the case of SHERPA, Jen went to Mt. Everest during the 2014 climbing season to make a film from the point of view of the guides who help foreigners reach the summit. Tragedy struck while she was there when a huge block of ice crashed down and killed 16 Sherpas. SHERPA was the only documentary selected for Official Competition in the 2015 Sydney Film Festival before a successful run on the international festival circuit, including Telluride, Toronto and London. It was nominated for a BAFTA and won the Grierson Award for Best Documentary Feature at the BFI London Film Festival. It went on to becoming the third highest grossing Australian documentary in history. Renan Ozturk is recognized as one of the world's best professional climbers and as a cinematographer who gets extraordinary results when he pushes the art of filmmaking in extreme locations, including at high altitudes. He was the cinematographer on the BAFTA-nominated documentary SHERPA, which documented events before and after the most devastating tragedy on Mt. Everest - it happened during the 2014 climbing season, which left 16 Sherpas dead. Renan was also one of the cinematographers on and starred in MERU, which won the US Documentary Audience Award at the 2015 Sundance Film Festival. Renan was also heavily involved in the ski movie INTO THE MIND, which was released in 2012. Co-founder of the Camp4 Collective, a production company specifically launched to tell stories about adventure sports. He has been recognized by North Face - as one of their professional athletes - and was named National Geographic "Adventurer of the Year" in 2012. About Robert Macfarlane - Screenwriter / Author of "Mountains of the Mind"
Macfarlane is seen as the influential inheritor of a tradition of writing about landscape, place, travel and nature. The film MOUNTAIN's philosophical perspective is developed from his book "Mountains of the Mind". The book won the Guardian First Book Award, the Somerset Maugham Award, and the Sunday Times Young Writer of the Year Award. It was shortlisted for the Boardman Tasker Prize for Mountain Literature and the John Llewellyn Rhys Prize. It is an account of the development of the Western attitudes to mountains and the precipitous landscapes.